Red Robin is a casual dining restaurant chain famous for serving more than two dozen craveable, high-quality gourmet burgers with Bottomless Steak Fries® in a variety of recipes as well as salads, sandwiches, entrees and soups in a fun environment welcoming to guests of all ages. Red Robin… YUMMM®! GIFT CARD TERMS. 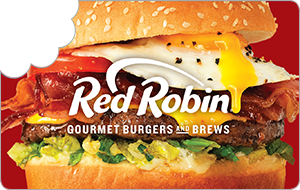 Use this gift card to purchase anything on the menu at participating Red Robin® locations, until the card balance runs out. Use of this card constitutes acceptance of these terms. Hold this card securely. Cards will ONLY be replaced UP TO THE REMAINING BALANCE if you submit gift card number and satisfactory proof of purchase. Not valid in Canada and where void by law. Not reloadable. Card cannot be redeemed for cash, except as required by law. Cannot be used to purchase gift cards. No expiration date or fees apply. To redeem your gift card, present a printed or digital copy to your server at the time of payment. The balance of the gift card will be deducted from your total.